The Ultra Recon Squad are a new group who come from a land hidden in Ultra Space, the Ultra Megalopolis. After Necrozma stole the light from their land, they soon arrive in Alola for mysterious reasons. There are four admins, Dulse, Zossie, Soliera, and Phyco. 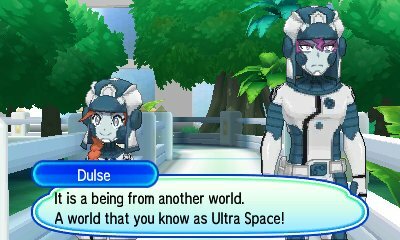 Dulse and Zossie can be found primarily in Ultra Sun while Soliera and Phyco can be found primarily in Ultra Moon. They bring the new Pokémon, Poipole, with them in battle. The first encounter with the Ultra Recon Squad is in Iki Town. As you approach the festival, you will encounter them and they will question why people are celebrating. After the festival, the Ultra Recon Squad appear again, commenting on the battle and start talking about "The Blinded One" and how to potentially use content from this world to stop and restore it. The next encounter is in Route 2 where they are detecting the "The Blinding One's power" nearby and go to investigate. You'll next find them within Verdant Cavern following your trial. They will state their curiosity regarding the Z-Crystals and the aura surrounding the Totem Pokémon. They will be shocked at the Poké Balls that you're using and inform you that they're investigating the Z-Crystals, before moving on. Next you'll find them in Seaward Cave while you're looking for Nebby. They note that they are looking for someone to help be strong enough to protect The Blinding One. However, they will have been exploring Poké Balls nad have caught a Pokémon, so challenge you to a battle. Upon defeating them, they will note that Cosmog is known to create wormholes which invite danger into the world. They then leave once again. 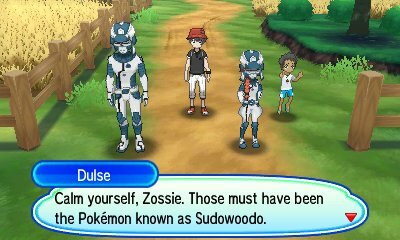 After completion of the Brooklet Hill trial, the Ultra Recon Squad will appear again, shocked at Sudowoodo not being a plant. They are fascinated by how unique the Pokémon in Alola are, and so decide to challenge you with a Pokémon that they are accustomed to. The next encounter with the Ultra Recon Squad is in the Dwindling Peak Tunnel. As you approach the end of the tunnel, you will see them. They note that the aura readings in the area are high and show they're unfamiliar with tunnels. They ask you if you are in control of the aura from Z-Moves and if you hope to master them.. They note that their world was once awash with similar light to that used in the Z-Moves, but then note they have a meeting. You then find them a bit down the road speaking to Colress to help create various machines. 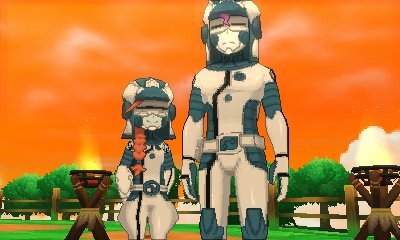 After defeating Nihilego in the Aether Paradise, you will meet the Ultra Recon Squad again, this time without their masks. They explain how they came from a world where Necrozma stole the light. They also explain that they are helping the Aether Foundation with their research into Ultra Beasts. 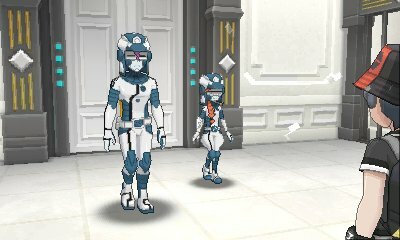 They reassure in the fact that if Necrozma or other Ultra Beasts come to the world, then they are helping the Aether Foundation to prepare in order to protect. 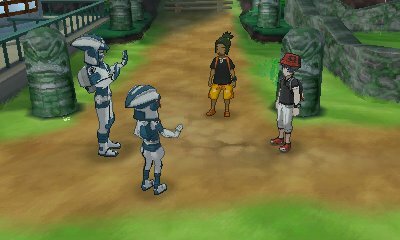 The next encounter is down the line in Tapu Village. They note that it's the remains of the village from when Necrozma last came to this world. They mention they have Necrozma safe in Megalo Tower and they're there to learn new ways to defeat it. The next encounter is after Lillie has been kidnapped and you go to the Aether Paradise. In Lusamine's house, they believe they are doing the right thing in letting Lusamina control Cosmog to open a wormhole to stop Necrozma, and so challenge you to a battle in order to stop you from stopping Lusamine..
After defeating them, when Lusamine goes into Ultra Space, then the Ultra Recon Squad come in, shocked by her intentions not to stop Necrozma to help them but just for her own satisfaction and notes that if Lusamine awakens Necrozma then it will come to this world to steal Alola's light. You'll next see them in Vast Poni Canyon as you go to the Altar of the Sunne/Moone. 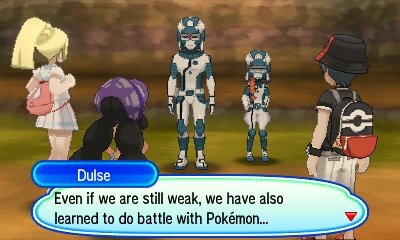 They, still angered by Lusamine's motives, say that you're not strong enough to defend their world and that they will do it instead, so challenge you to another battle to get you to back down. 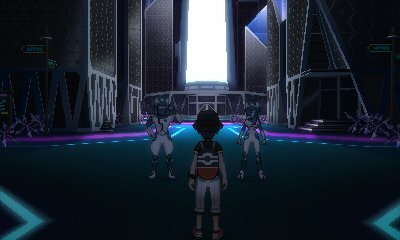 After using the Sun Flute/Moon Flute to awaken Cosmoem's evolution, the Ultra Wormhole will open and Lusamine & Guzma will fall out of it and Necrozma will fuse with Solgaleo or Lunala and then, after being defeated, return to Ultra Megalopolis. 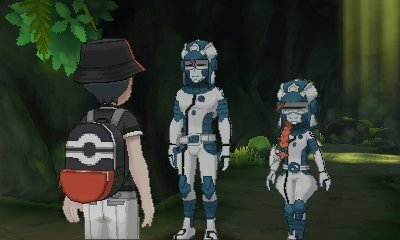 The Ultra Recon Squad appear soon afterwards and offer you a way to go to there in order to stop Necrozma after seeing how it was distracted by your Z-Crystals, offering you the ability to ride upon their Lunala/Solgaleo to go to it. When in Ultra Megalopolis, you'll encounter the other admins from the team who say that Necrozma is sitting at the top of Megalo Tower. When you go up there, you have to battle Necrozma in order to calm it once and for all. 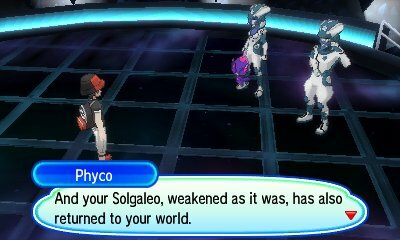 Defeat it, and it'll separate from Solgaleo/Lunala and fall back to your world, injured. 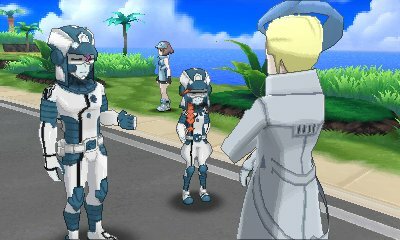 With Necrozma defeated, the Ultra Recon Squad will come and thank you for saving not only Alola, but their world as well. As thanks, the Poipole they are with wishes to join you. You can accept this now or return to Ultra Megalopolis later in order to receive it. When you return, you will also be able to switch which Pokémon you use for the Ultra Warp Ride. There is one more encounter with the Ultra Recon Squad. 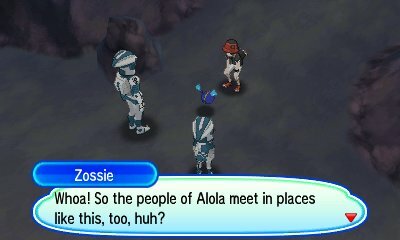 Staying in Alola to help the Aether Foundation, they discover that some Ultra Beasts have come through and are causing issues in Poni Grove on Poni Island. 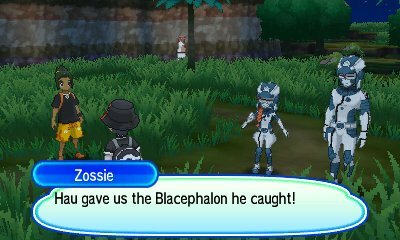 They will ask for you and Hau to come with them to stop the Blacephalon in Ultra Sun or Stakataka in Ultra Moon. With Hau capturing one for their research, they let you capture the other two.